Whether you skiing enthusiasts like to admit it or not, High Country fishing is close. It's almost 2019 and each day that passes gets us closer to alpine lakes filled with willing cutties and our favorite small streams and their dry fly loving residents. With some of the 2019 gear starting to arrive, we've cultivated a collection for the angler who loves the pursuit of high country gems with some of the latest and greatest gear so that you'll be primed and ready to go when you make your way to high elevation in 2019. We've always been big fans of the RISING nets! What's not to love about a durable, customizable, and American-made nets whose handle stores your favorite celebratory liquid? Not much, from our perspective. The Brookie Net is the perfect size to pack with you while you're headed up into the mountains and will hold even the largest of high country trophies. This ALL-NEW Shift Backpack has a 2-in-1 design that has many of us in the shop eagerly awaiting it's imminent arrival. It's sizable - 35L in fact, water-resistant, and has a waist pack that swings around to the front for quick access for vital tools. Just in case you can't visualize that - we'll say it in another way. The Rotation 180 waist pack can be stored in the pack or swung around to the front like a fanny pack. That's the kind of seamless design that will make your day easier and more comfortable on the water...especially in the high country. Designed to load at close range - the RIO Creek is perfect for small streams, brooks, and creeks. This fly line accel at making short casts of 10 to 15 feet with ease. But, it still has enough head length for those occasions when a longer cast is needed. There's no mistaking it...small water is meant for modern classics like the Abel TR. Made in Montrose, Colorado - the TR has the iconic sound of a click-and-pawl. As always, the machining of these Abel reels is second to none. 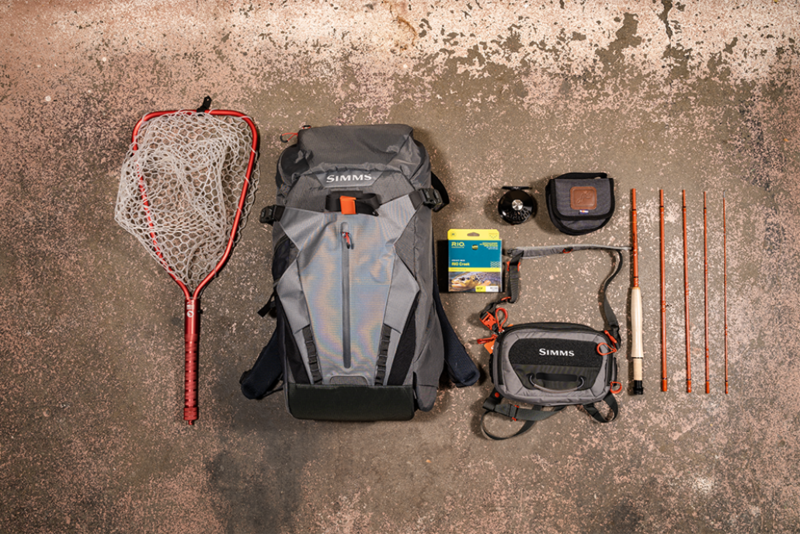 The ALL NEW SIMMS Freestone Chest Pack is compatible with the new Shift Backpack. Actually, it's compatible with all SIMMS waders and backpacks. But, if you're looking to keep your gear close and at the ready, look no further than the Freestone Chest Pack. With two interior pockets for fly box organization and a magnetic dock for nippers and/or clamps, the Freestone Chest Pack has you covered. The Montrose-made Scott F-Series is THE rod for small, high country water. These light-weight fiberglass gems are optimized to cast beautiful accurate loops under 20 feet. Perfect for dinking and dunking dry flies in every fish holding pocket you can dream of.